Light art by Belgium-based artist Ann Veronica Janssens fills the galleries on the two top floors of Kiasma in Janssens’ first solo show in Finland. Janssens has been fascinated by light and associated phenomena ever since she was a child. Many of her works are based on light interacting with liquids, fog, reflecting surfaces and the surrounding space. Janssens seeks to heighten our awareness of these fleeting sensory phenomena. In her art, Janssens explores ordinary physical phenomena in highly visible ways. She often finds inspiration for her works in lucky coincidences. One of the highlights of the show is chromed bicycles that visitors can ride in the large gallery on the fifth floor of Kiasma. Janssens wants to offer the cyclists and other viewers a completely new experience of the space, drawing attention to the transparent materiality of the light and air around us. Other works in the show includes Orange Sky Blue, a landscape of light that is visible outside the museum from Mannerheimintie, and Untitled (White Glitter), consisting of glitter strewn about the gallery floor at random. Janssens likes to use surprising materials in her work, such as paraffin oil and reflective surfaces. Janssens typically uses only a few materials in her works. For her, art consists not of an object but an experience evoked by light, colour, sound and movement. The minimalist works invite visitors to move around them and examine them from different angles, to sharpen their senses and to be surprised. Not everything is what it seems at first. Ann Veronica Janssens, Untitled (blue glitters), 2015. Calling for a sort of dematerialization of the exhibition principle in Albedo, the MAC’s has brought together two artists whose practice tends to question or even pulverise space by investing it with their minimal interventions. In this way, they invite the museum and the public alike to free themselves from material, tyrannical objects, for the space of one summer, and devote themselves fully to the intimate, physical, aesthetic experience of a given space through colour and light. Coinciding with Janssens's exhibition at the Baltimore Museum of Art, featuring one of her iconic Fog Star works installed in the museum’s Neoclassical Spring House directly adjacent to the main museum building, Janssens will mount approximately 20 “silver screens” on the facades of theaters and cinemas across the city of Baltimore in the coming months. At a range of different sizes—but always in the proportion of classic widescreen film—these “silver screens” refer to the impressive history of theaters and cinemas unique to Baltimore. Between 1900 and 1970, the city constructed a total of 235 theaters, far more than in most American cities. Some of these theaters are still open, others closed, and still others repurposed. Janssens was drawn to the architectural typology of theaters and specifically cinemas in Baltimore for their symbolic value—at a fundamental level these buildings were conceived to perform just as her work does: transforming light into content. At the core of Janssens’s practice is a keen interest in light’s ability to dramatically alter one’s perception and experience. Coated in aluminum leaf, these “silver screens” also refer to Baltimore’s history in the silver industry. Installation view, Ann Veronica Janssens, "Fog Star", 2018. 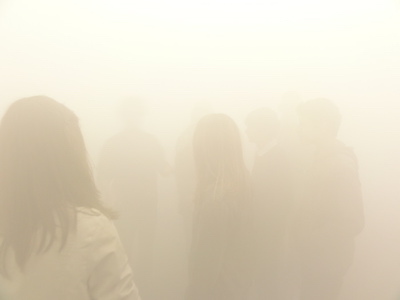 Ann Veronica Janssens’ Fog Star, which opened to the public last week, is a testimony to the potential appeal of a simple, interesting concept executed precisely and with restraint. In the BMA’s often-overlooked Spring House (a small, temple-like structure designed two centuries ago by Benjamin Henry Latrobe), Janssens has introduced a haze machine and mounted seven bright lights in a pattern on a wall at the far end. In a thin fog, seven beams of light thus coalesce into a star – or break down into a cacophony of swirling beams, depending on where you stand. The result at once delightful and subtle: a piece of eye candy that will please the selfie crowd, but also a coy meditation on space, light, and history. Janssen, who was born in England in 1956 and is now based in Belgium, has worked with light for years, and has frequently spoken of her desire to prompt viewers to experience familiar surroundings in new ways. Fog Star combines these interests. From a distance, the piece is all flirtation and unresolved promise; partial glimpses of the light bulbs and the pinkish red interior seem calculated to attract attention, without revealing too much. Come closer, though, and the piece rewards you. As you approach the threshold of the spring house’s central door, the seven bulbs are suddenly all visible, and snap into a crisply distinct configuration: an ethereal heptagram, suspended in a mist. Once inside, an artificial haze obscures all navigational reference points. On the far wall, beams of light form a seven-pointed star, which morphs between palpable geometry and amorphous atmosphere as visitors move about the space. Fog is a substance of abiding fascination for Janssens. Her Fog Star series explores the capacity of fog to give sculptural form to light. Focused on fleeting and intimate experiences of the world, the artist draws viewers’ attention to our own processes of perception within a surrounding environment. Janssens (b. 1956, England) lives and works in Brussels. For more than three decades, she has used light, fog, saturated color, and reflective surfaces to compose environments that dazzle and disorient viewers into experiences of active perceptual engagement. Janssens’s work has been the subject of numerous solo exhibitions across Europe. Together with the artist Michel François, she represented Belgium at the 1999 Venice Biennale. Her first solo presentation at a museum in the United States took place in 2016 at the Nasher Sculpture Center in Dallas. This is the first extensive solo exhibition of Janssens's work in the UK and includes new and recent sculpture and installation. Janssens explores spatio-temporal experience and the limits of perception through precise installation and minimal sculpture. 'I investigate the permeability of contexts' she has said, '[...] even as I propose a form of deconstruction that fragments our perception of these contexts.' Her first works, made during the 1980s, were constructions or spatial extensions of existing architecture such as Gallery inexistent, Antwerpen (1988), an installation created by stacking borrowed concrete blocks in a gallery space. Since then, however, she has often applied scientific knowledge to the use of non-material mediums such as light, mist or sound. Her works can act like triggers, encouraging heightened visual awareness by exposing or revealing the transitory conditions of particular situations and a slowing down of perception. This exhibition can get your head spinning. Artists leave the established to seek other states of consciousness. They lure the audience into a confrontation with their own convictions. The group exhibition Dizziness. Navigating the Unknown is the result of the artistic-research project Dizziness – A Resource, which is being implemented since 2014 by Ruth Anderwald and Leonhard Grond at the Academy of Fine Arts in Vienna, in collaboration with the Institute of Psychology at the University of Graz. In the project, the various states of instability become the starting point for exploring the frontiers of philosophy, cultural studies, medicine, research into creativity and innovation. The exhibition will feature the works of thirty-three artists from around the world, created in the second half of the 20th century and in the 21st century. These works instill in the viewers the sensation of disarray mentioned in the title of the exhibition. The premeditated artistic strategies force the audience to confront their own convictions, directions of thought as well as intentions. Artists elicit questioning of the established rules or the ongoing changes in the world. They go beyond what has previously been established, beyond the generally accepted framework of thinking. 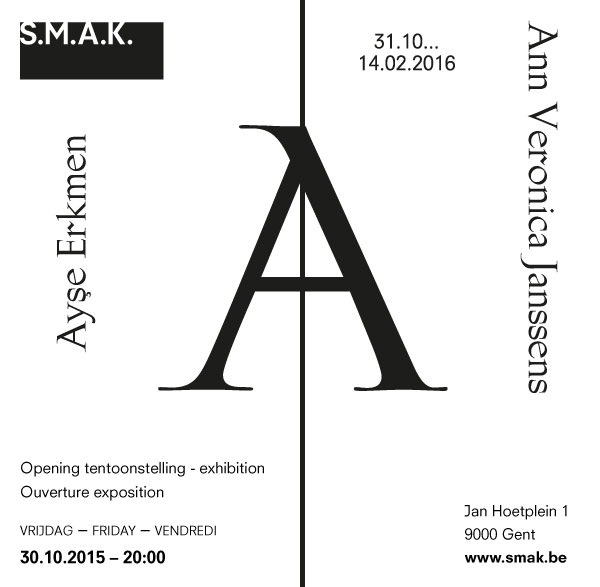 Ann Veronica Janssens's work will be the object of a triple exhibition, Naissances Latentes, at Le SHED. Janssens's artistic practice could be defined as a study of the sensory experience of reality. Through various types of devices (installations, projections, immersive environments, sculptures), Janssens's works emphasize space through the diffusion of light, the radiance of color or reflective surfaces, revealing the instability of our perception of time and space. 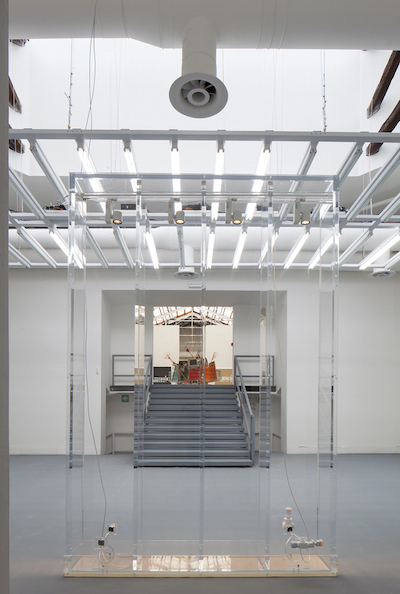 Philippe Parreno installation view, Central Pavilion, Venice Biennale. Qwalala, a monumental new sculpture by artist Pae White, will open to the public on the Island of San Giorgio Maggiore in Venice, coinciding with the 2017 Venice Art Biennale. Qwalala consists of a curving wall made only of solid glass bricks, which occupies the entire area opposite LE STANZE DEL VETRO. At 75 metres long and 2.4 metres high, the 3,000 glass bricks for Qwalala were hand-cast by Poesia Glass Studio in the Veneto region. Each of these hand-cast bricks is unique, owing much to the chance and variation inherent in the artisanal manufacturing process. To coincide with the 2017 Venice Art Biennale, the Axel & May Vervoordt Foundation and the Fondazione Musei Civici di Venezia will present their sixth and final exhibition: Intuition. The exhibition will explore how different manifestations of intuition have shaped art across geographies, cultures and generations. It will bring together historic, modern and contemporary works related to the concepts of dreams, telepathy, paranormal fantasy, meditation, creative power, hypnosis and inspiration. 1301PE is pleased to announce MARS, a large-scale solo exhibition of Ann Veronica Janssens' work at the Institut d'art contemporain. The entire space will be dedicated to new pieces referring to existing works. 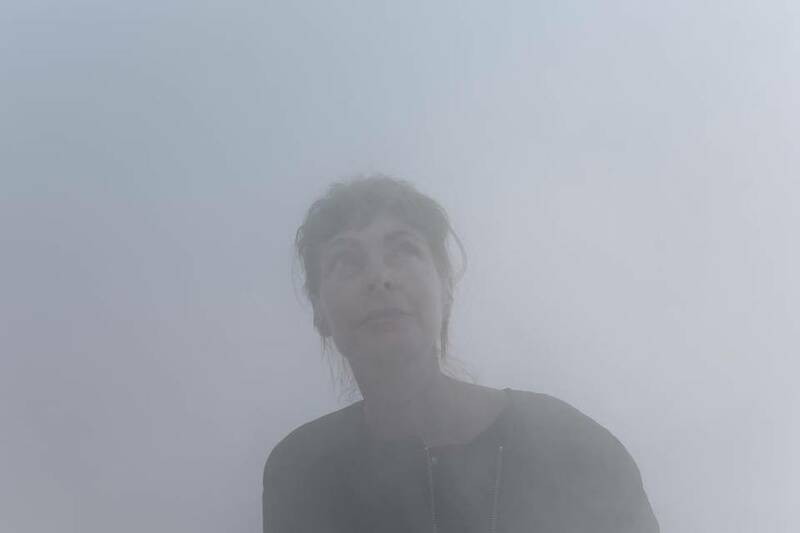 Ann Veronica Janssens bases her work on the act of perception, developing an experimental research through the prism of physical phenomena such as light, colour, sound, or mist. Using stripped-down gestures, the artist activates 'undefined zones' between blindness and revelation. These gestures seek to render manifest the indefinable and transitory nature of the very material of reality. Duration, space, and movement determine their primordial conditions. The most civilized spot in this city of sprawl, tall buildings, shopping malls and a spider's web of highways is one of Renzo Piano's great buildings, the Nasher Sculpture Center in the downtown arts district. Until several years ago, at the end of its stately garden filled with masterpieces by Rodin, Picasso, Calder, De Kooning, Moore, Di Suvero, George Segal and Richard Serra, there also stood one of James Turrell's "sky spaces," an enclosed room in which a visitor could look up at the changing heavens. As a consequence of a continuing dispute with a neighboring condominium tower whose height eradicated the room's sky view, the piece has been closed permanently. Mr. Turrell is a master of light. Now, another master of light's uses and effects, Ann Veronica Janssens (British born; Belgian based), is having her first solo American show here. Outside, to the right of the Nasher's main entrance, "Green Aurora" is a small, projected light piece, barely noticeable. Indoors, placed diagonally on the floor, lies "IPE 700," a single 23-foot-long steel I-beam, its top side polished and reflective. In its solid materiality, this is the most conventional of Ms. Janssen's works here. As you look around you, materiality gives way to light and lightness. Four pieces she calls "Aquariums," variations on a theme, of identical size (21 5/8 inches cubed) and made of glass, distilled water, paraffin oil, and ink or silkscreen, stand atop identical wooden bases. They refract the light, and they also reflect Mr. Piano's signature grids for the Nasher roof above. Each is titled and colored differently: "Cocktail Sculpture" is pure glass; the others are called "Orange," "Margarita," and "Blue Wind" for their main shades. They will remind viewers of Donald Judd's 100 milled aluminum boxes in Marfa, Texas. Click here for full text and video. The work of Ann Veronica Janssens, a British artist who lives in Brussels, precipitates the heightened optical and spatial awareness similar to that of Light and Space but without the often attendant fuss that seems antithetical to the movement’s less-is-more, dematerialized aesthetic. At least as seen here, in her first solo show in the United States, Ms. Janssens’s efforts avoid the more grandiose Light and Space hallmarks, including the immaculate built-out environments, computerized light shows and viewers removing their shoes. The results are less immersive, but more thought-provoking. At Bortolami, Ms. Janssens, who has shown in Europe since the early 1980s, presents six eye-teasing works. The most immediately arresting is a thick layer of aqua-blue glitter, spread on the floor. About the size of a kiddie pool, it is lush and dazzling and flashes shades of green and yellow as you circumnavigate it, almost as if its surface were moving. More understated are two modest sheets of corrugated aluminum that jut out from two walls, tilting upward, a little like awnings. They seem to levitate, delicately shaded on their undersides and glowing on top, as if harboring concealed lights. Actually, the aluminum is covered with platinum leaf, and each piece is fittingly titled “Moonlight,” which is, of course, all reflected. A narrow portion of vertical blinds, titled “California,” also seems lighted from within but is simply covered with gold leaf. The show culminates in a room where seven spotlights with pink gels form a circle on one wall while a haze machine lends heft to their crossing beams, which cast a lotuslike pattern on the opposite wall. These pieces might weaken if seen separately, but together their trick-free, low-tech magic is refreshing. Ask your children if they would like to take a walk in a rainbow. The answer should be a unanimous yes. You can deliver on this enticement at the Nasher Sculpture Center in a new exhibit by Belgian artist Ann Veronica Janssens. Janssens is an artist who manipulates light, and in her piece titled Blue, Red and Yellow, a rainbow of light is encased in a large rectangular box in the Nasher's garden. She fills the box with fog from a fog-producing machine, and as the sunlight streams into the box made of colored plastic panels, it transforms the fog into clouds of color. Unexpectedly, though, the fog is so saturated that as soon as people enter the cube, they disappear. You can hear them; in fact, audio perception is heightened, but you cannot see them. All that can be seen are the billowing colors that change through the prismatic palette and the tiny optical floaters that are always there on your eyes but are rarely noticed. It's beyond weird in a wonderful way. This new installation by Ann Veronica Janssens explores light and colour as she invades the gallery with coloured mist. Colour is caught in a state of suspension, obscuring any detail of surface or depth. Instead, attention is focussed on the process of perception itself. Janssens's work is both disorienting and uplifting as the daily wonder of conscious experience is given renewed emphasis.